If you received a red light camera ticket by Cite-Web.com Conduent Business Services, the following information may help you to get your ticket completely dismissed, without going to court. Red light camera tickets can be very expensive, often costing $490 or more for just the fine amount. If you add the impact this ticket can have on your driving record and insurance premium, it makes sense to find out how you can get this ticket dismissed. This is a “snitch” ticket with the 4 photos arranged on the bottom of the page. You can safely ignore this notice. In the worst case scenario, you will just receive a real ticket, and you can take care of it at that time. This is a real ticket with the 4 photos arranged on the right side of the page in a column. This ticket cannot be ignored. The login information is usually found on the back page, first paragraph. Sometimes it is found on the front page, upper-right corner area within a red rectangle. Don’t just pay the $490+ fine and plead guilty! Did you know that many camera tickets can be successfully dismissed just based on the quality of the driver photo alone? That is just one of the many types of defenses that are available for camera ticket violations. With our assistance, thousands of our customers got their red light camera ticket dismissed! No obligation and no charge! Your information will be kept completely confidential. * This information and other login information are found on the camera ticket letter(the one with the 4 photos on the right side of the page). Please check the upper right corner area of the front page, and the first paragraph of the reverse page. 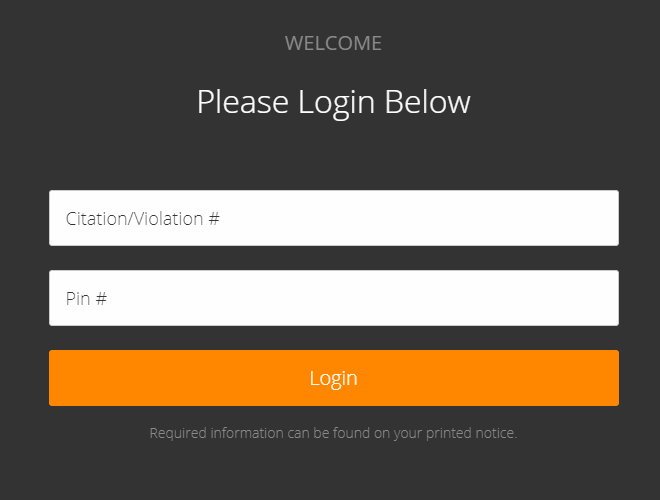 By providing us with the login information, you are expressly requesting that we log in to the camera ticket website and view the photos and video, and any related information that is available at the website. If you still have problems finding the login information, or your ticket is showing a different website, please send us a copy of the front and the back page to the email address below this form. The Citation # can be found on your ticket letter. This is the license plate number of the car that was ticketed. Please DO NOT put your drivers license number here. The Notice # can be found on your ticket letter. The PIN # can be found on your ticket letter. Ticket Ninja can help you get your red light ticket Dismissed! I received a red light camera ticket. What is the best way to proceed? First thing you should do is to find out whether your particular camera ticket has a good chance of being dismissed, if you decide to contest it. Knowing whether you have a good chance of winning will help you to make the right decision on whether to just pay the ticket or fight it. The driver photo looks like me. Do I still have a chance? 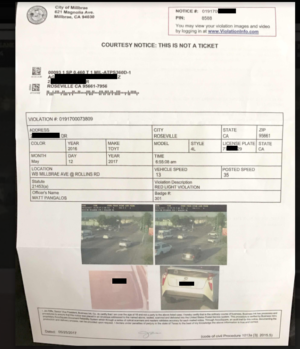 Even if you recognize that it is you who were driving, the quality of the photo may still be bad enough that we can still get the ticket dismissed. Automatic enforcement systems(red light camera tickets) are REQUIRED BY LAW to be able to produce a “clear” picture of the driver. If the driver photo is not “clear”, there is a solid legal basis to get the whole ticket dismissed just on the grounds that the driver photo is not clear enough. I almost entered the intersection under a yellow light, and the yellow light seemed to be kind of short. What are my chances? One of the defenses that we have used successfully is the yellow light interval defense, where we will claim that the yellow light interval seemed to be unusually short. We will ask the red light camera operators to prove that the yellow light interval was set properly and that it was in proper working condition at the date and time of the citation. I do not remember seeing a warning sign, what should I do? If you think there was no “Photo Enforcement” warning sign that was posted near the intersection, you should go back to the intersection and check. Please keep in mind that sometimes the sign is posted way before the intersection, and sometimes right at the intersection. If there are any kind of obstruction of the sign(for example, tree branches), you should take some photos and forward it to us. What is the best way to find out what my chances are? The best way is to have us review your ticket photos and video. 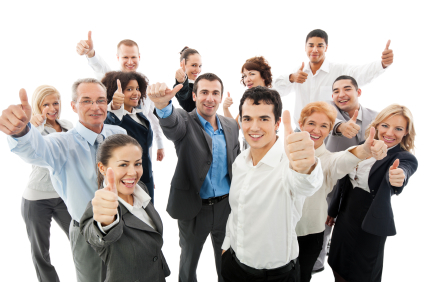 We do not charge any fees for this service and there is no obligation to use our service. Once you submit the login information to us(use the convenient form above), we will get back to you within 24 hrs or sooner by email with a full assessment of the best way to fight your ticket. If we do not see a good defense that you could use, we will also let you know. If I decide to use your services, how do I start? Just sign up under “Get Started” and within 4 business days, we will get your defense paperwork ready and send it to you by email. Once you receive the custom prepared paperwork form us, you just need to print it out, sign it, and mail out to the court. You do have to include the payment for the bail amount(equal to the fine amount) directly payable to the court at that time. 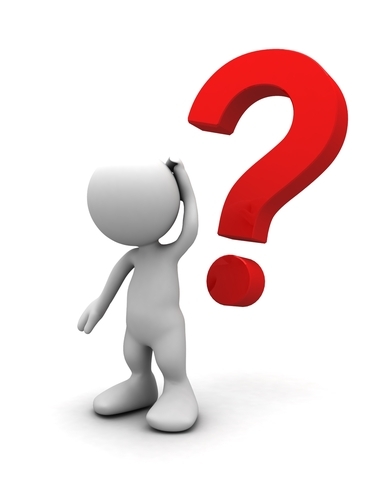 Once I mail in the defense paperwork, how long does it take for a decision? On the average, it can take about 2 to 3 months for the court to send you a letter of decision. If your ticket was dismissed, you will receive a full refund of the bail amount within 45 days from the date of the decision letter. 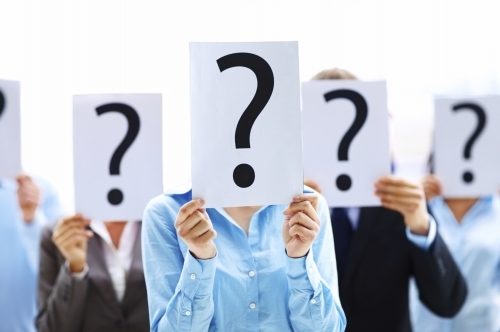 What happens if I do not win on the Trial by declaration(TBD)? Option 1: Just ask for traffic school and stop fighting the ticket. Option 2: Send in the New trial request and go to step two. Step two is the New trial phase, and Ticket Ninja will support you throughout this process by getting you ready for trial by phone consultations and also by sending you material that will educate you on the key points of your defense. However, it is not part of Ticket Ninja’s service to represent you in court or go to court for you. 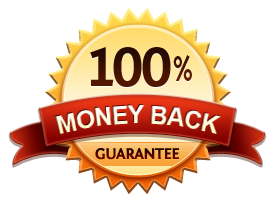 Ticket Ninja CA will refund 100% of the $99 document preparation fee if your citation is not dismissed or reduced after using the defense we have provided for you in the trial by declaration defense package, in the (1)Trial by declaration and in the (2)New trial. If your citation is not dismissed or reduced after using the defense we have prepared for you at the New trial, just submit written proof(Minute Order from the court) that you have contested your citation at the New Trial(Trial De Novo) and your citation was not dismissed or reduced, within 30 calendar days from the date of the New trial and we will refund the $99 document preparation fee within 5 business days. If your fine was reduced, but by less than $99, Ticket Ninja will refund the difference to you. If your fine was reduced by $99 or more, there is no refund. Rush fees are not refundable and considered fully earned regardless of whether your citation is dismissed or not. If you do not use the Trial by Declaration paperwork that we have prepared for you, for whatever reason, you cannot ask for a refund of the $99 document preparation fee that you have paid to us. 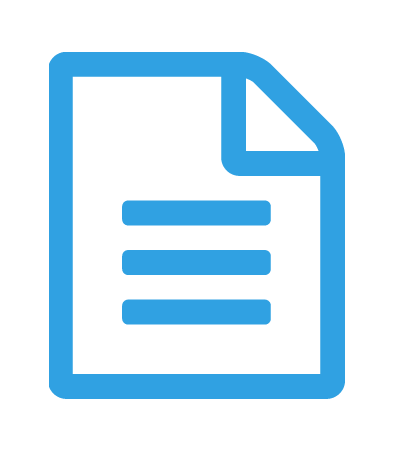 Our document preparation fee is fully earned when we take the time and effort to review your ticket information and prepare your Trial by Declaration defense package. How can I tell a Snitch ticket from a real ticket? 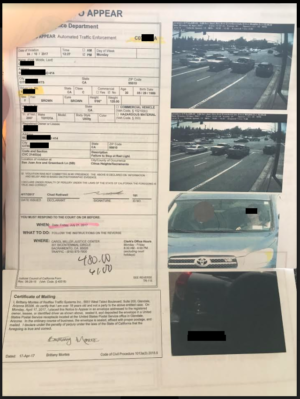 A “Snitch” ticket is what the police department sends out to the registered owner to find out the identity of the driver, and can be easily recognized by the placement of the 4 photos on the bottom of the page. You can completely ignore this notice and not respond in any way. The worst that can happen is that you may get a real ticket which you can then respond to at that time. A real ticket always has the 4 photos on the right side of the page in a column. This ticket should not be ignored as the fine amount will double and go into collections if not dealt with in the correct way. Ticket Ninja will beat your Cite-Web.com Conduent Business Services camera ticket for $99 or your money back! We offer the BEST VALUE, and you can count on us to STAY WITH YOU all the way to the end! How to fight 21453(a) or 21453(c) red light camera tickets: If you received a red light camera ticket, or a red light ticket issued by an officer, it does not mean that you deserved it. It can be tricky to successfully fight your 21453 a red light ticket, but in many circumstances the effort and time can be well worth it. Below are information and strategies on how to fight 21453(a) and 21453(c) red light camera tickets, that are highly effective when used properly. The yellow light interval in all the intersections has to be set according to the speed limit in the vicinity of the intersection. 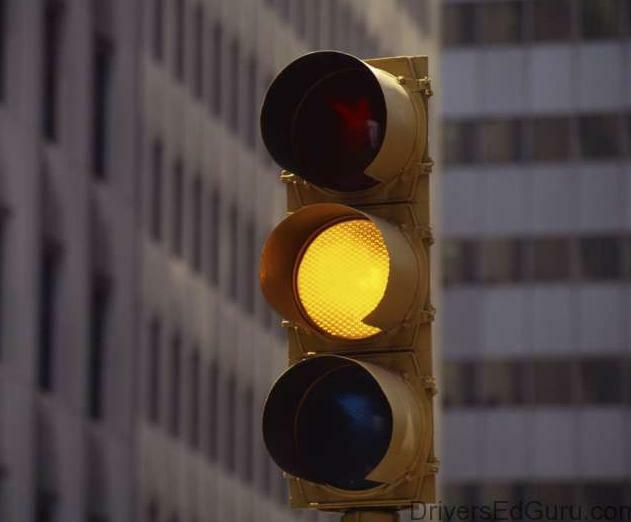 In certain cases, the yellow light interval are not set properly or set too short, and can trigger an increased number of 21453 a and 21453 c red light camera tickets being issued. These tickets can be successfully challenged in court, but by using the trial by declaration process, you can provide a more complete defense for your ticket without going to court. This is why a Trial by Declaration should always be the first step to fighting your California 21453 a vc red light traffic camera ticket and also for red light tickets issued by an officer. The driver photo must be clear in order for the camera ticket to be valid. When the driver photo is fuzzy, grainy, or generally not clear, the red light camera ticket issuing agencies are not supposed to issue those citations. When these 21453 a or 21453 c red light tickets do get issued with bad photos(most people just pay their tickets, so why not? ), they can be successfully challenged through Trial by declaration. In California, it is possible to get your red light camera ticket dismissed based on the quality of the driver photo. Ticket Ninja CA can help you prepare your Trial by Declaration defense form so that you can take advantage of these and other methods that the law has provided for you. Compliance defense can be an effective way to dismiss red light camera tickets. When the driver photo looks clear, and the yellow light timing seems to be in order, the ticket can still be challenged through what is called the compliance defense. All red light camera locations must have gone through the proper steps and documentations to become approved to be legally able to issue red light camera tickets. A compliance defense demands that the system operators show that the location is fully compliant with all of the various requirements such as proper notices, equipment calibrations, and other documentations. In California, it is possible to get your 21453 a or 21453 c red light camera ticket dismissed. Ticket Ninja CA can help prepare your Trial by Declaration so that you can take advantage of these and other methods that the law has provided for you. California law requires that the photo enforcement warning sign be placed at all photo enforcement equipped intersections. 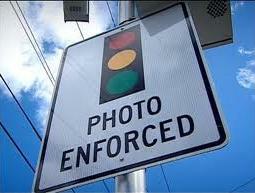 When the photo enforcement sign is missing or obstructed, the red light camera tickets can be successfully challenged. In California, it is possible to get your 21453 a or 21453 c red light camera ticket dismissed based on the legal requirement that the photo enforcement locations have adequate warning to let the drivers know that the intersection is equipped with cameras. Ticket Ninja CA are experts at preparing your Trial by Declaration so that you can take advantage of these and other methods that the law has provided for you. Ticket Ninja CA can help you get your California red light tickets dismissed!